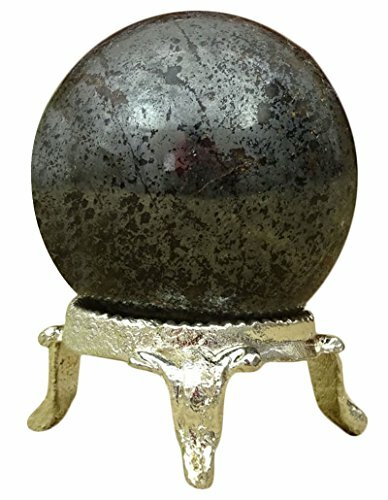 * Beautiful Black Iron Pyrite Stone Sphere Ball Healing Balancing Reiki. * Stone: Black Iron Pyrite Stone . * Size - Diameter - 3.5 cm (Approx). * Weight - 150 Grams (Approx). * This Sphere Ball Useful for Positive Energy Healing Meditation Peace of Mind Chakra Balancing & Concentration. * P.S: We have mentioned the approx. Weight but Weight may vary 40 Grams Lesser or Higher. * P.S. : This Listing Is Only For Sphere Ball Stand Is Not Included. * P.S: We Have Mentioned The Approx. Size But Size May Vary In Length and Width | The Product You Might Receive Can Be Vary In Design. For more Reiki Healing Crystal products click on the link "HARMONIZE" under the title. If you have any questions about this product by HARMONIZE, contact us by completing and submitting the form below. If you are looking for a specif part number, please include it with your message.